Long lines, slow delirious processing, and tedious payments are a thing of past. The old traditions have now made way for the uber cool world of travel apps that not only help you book tickets but also brings in a bunch of amenities where you can easily pay for your hotel bookings, scour for travel packages suiting your requirements, research about your destination, avail exciting offers & discounts, find travel partners and many more. From luxurious travels to budget journeys, travel apps, with their quick and savvy characteristics, are transforming the way tourism industry functions. This change can be observed by studying the latest statistics which depicts around 60 percent of smart phone users regularly deploying travel apps to book hotels, find directions, gain information or book their flight/train/bus tickets. These travel solution are now go-to services that help travelers attend to the minute and significant detail pertaining to their travel. Amidst this revolutionary scenario, there is no space for the outdated. Hence, travel apps today need to be constantly upgraded and have the knack to offer all the service in one nutshell. 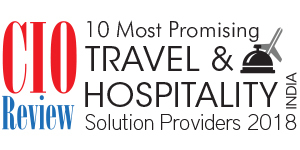 Addressing to this fast paced and growing industry, CIO Review brings to you the ‘10 Most Promising Travel & Hospitality – 2018’ directory listing the companies which are offering exemplary services in the industry. An expert panel of travel industry experts along with CIO Review Editorial Board has performed a diligent evaluation of the industry before listing the front runners. The travel solution listed are the ones which have distinguished themselves through successful ideation and implementation of practical ideas that complement with the market requirements as well as cater to the end consumer. This listing will assist our readers in selecting well-suited and impeccable travel solution that will help them understand the latest nuances and stay abreast of the development prevalent to tourism & travel. We present to you CIOReviewindia 10 Most Promising Travel & Hospitality - 2018.